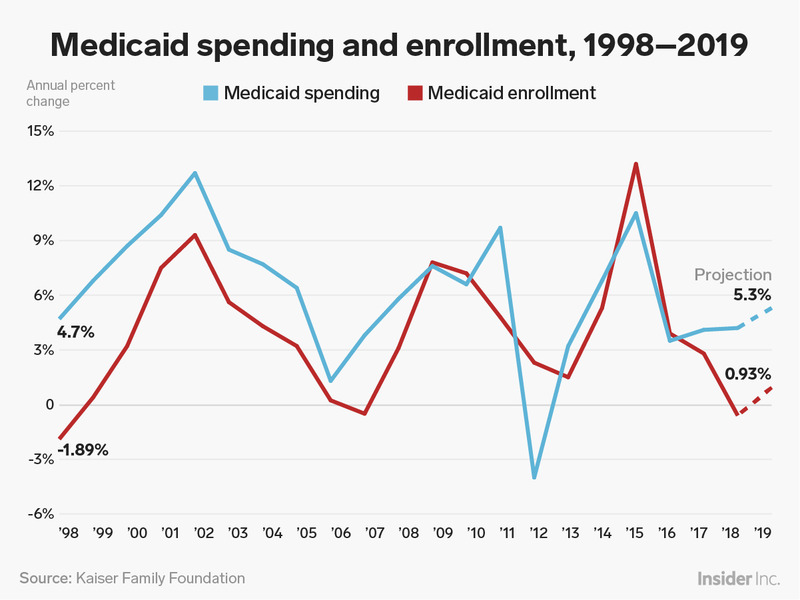 For the first time in a decade, Medicaid enrollment did not grow in 2018. According to a new Kaiser Family Foundation report, enrollment fell 0.6% in 2018. Medicaid spending continued to rise, increasing 4.2% in 2018, due to a higher number of seniors enrolling. The drop in enrollment was due to the strong economy and policy changes made by states. Medicaid enrollment could change significantly in the next few years given policy changes such as work requirements and ACA expansion being considered by state governments. For the first time in a decade, Medicaid enrollment hasn’t grown in 2018. While enrollment into Medicaid, the state and federal program that covers medical care for some low-income Americans, slowed down in 2018, spending continued grew 4.2% compared to 2017, according to a survey conducted by the Kaiser Family Foundation. KFF attributed the growth in spending to the number of seniors joining the program compared to children and adults, who are less expensive to cover. States told KFF that a stronger economy led to fewer adults qualifying for the program. Medicaid is designed to help low-income Americans get access to healthcare, though the exact threshold for qualification depends on whether the state expanded Medicaid eligibility under the Affordable Care Act (ACA), also known as Obamacare. In states that expanded Medicaid eligibility, adults who make as much as 138 per cent of the poverty level can qualify. In those that didn’t, the thresholds are far lower, and the program can mainly serve some disabled individuals and parents and their children. With unemployment hitting multi-decade lows and wages rising, the number of Americans climbing above those cut-offs more than offset the general population growth and other changes in the composition of Medicaid enrollees. Medicaid enrollment last declined in 2007, according to the survey. The organisation also attributed the growth in spending in part to more outlays for pricey medications like treatments for HIV and hepatitis C, as well as more getting spent on substance-use treatment, mental health, and long-term care for seniors and those with disabilities, as well as policy changes that raised the amount of money doctors and nurses are getting paid. 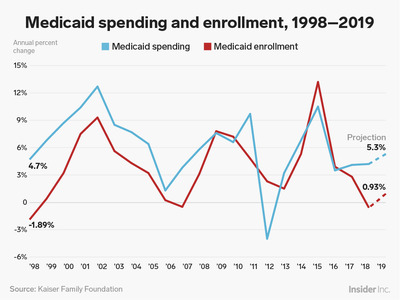 While the Medicaid enrollment rate remained steady in 2018 and is expected to do so again next year, the authors of Kaiser’s study did point to a few political factors that could affect the outlook. Currently, three states will vote on Medicaid expansion in the 2018 midterms – Idaho, Utah, and Nebraska – which could help boost enrollment numbers as previously ineligible people in those states could be able to get access to Medicaid. According to estimates, just under 120,000 people could be eligible for Medicaid if Idaho votes for expansion, 86,000 could be eligible in Nebraska, and 158,000 could be eligible in Utah. But working in the other direction is a slew of new proposals from states that would change eligibility rules for Medicaid, the most notable being the imposition of work requirements. 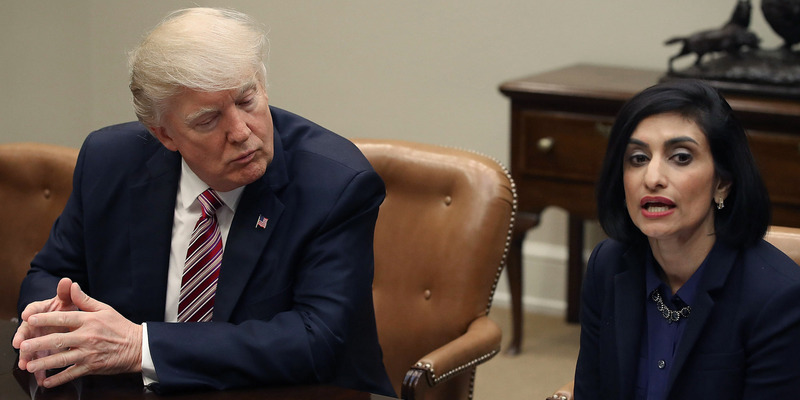 The Trump administration has allowed states to set rules to impose a minimum amount of hours that a Medicaid enrollee must work, or do other activities like volunteering or training. While most enrollees are either disabled, too old to qualify, or already work, administrative difficulties and other factors are expected to result in enrollment declines for states that do impose work requirements. Arkansas, which imposed a work requirement in June, has already seen enrollment drop by just under 8,500 in just two months. Indiana and New Hampshire already have waivers approved by the Trump administration to start the requirements in 2019, while four others states – Alabama, Maine, Ohio, and South Dakota -have waivers pending. One state, Kentucky, must resubmit a waiver due to a court order before rolling out its work requirement.